At the time of Independence back in 1963, less than 7% of Kenya’s land mass had been set aside as National Parks – a smaller percentage than many other countries in Africa or the rest of the world. However as the population of Kenya in 1963 was only about 12 million, the areas adjacent to the parks and reserves were mainly very sparsely populated and so the wild animals were able to migrate outside and were not confined within the park boundaries. Today the human population in Kenya is four times the size that it was at Independence, and as a result there is much less land available outside the parks for wildlife as it is needed by humans. So there has been a huge impact on wildlife caused by habitat loss since much of the land beside the parks is becoming developed and heavily settled, or fenced off as farmland for cultivation or livestock ranching, while forests are cleared and rivers diverted for irrigation. This loss of protected habitat is the main reason that wildlife populations have plummeted in Africa and elsewhere but in recent years this problem has been addressed by some conservation-minded safari companies who have established new wildlife conservancies on tracts of land leased from communities adjacent to the parks and reserves. This has actually expanded the area of habitat now available for wildlife beyond the parks and reserves and within these new conservancies there has been a regeneration of vegetation and a big increase in wildlife including big cats and elephants as well as a wide range of herbivores. The renowned elephant conservationist Cynthia Moss has written recently: “The establishment of the Conservancies in Kenya has been the single most successful conservation initiative since the creation of national parks in the 1940′s. Conservancies protect land for Kenya’s wildlife and even more important create sanctuaries of safety. In addition conservancies bring benefits in the form of direct payments and jobs to the people who share the land with wildlife”. Researchers have been monitoring the positive effects of the Conservancies in Kenya and it is striking that the animals learn very quickly where they are safe. Niels Mogensen, Chief Project Officer, Mara Lion Project is tracking the movements of a lioness named Nenkume in Ol Kinyei Conservancy in the Mara. The collar is on for two years and then drops off automatically. 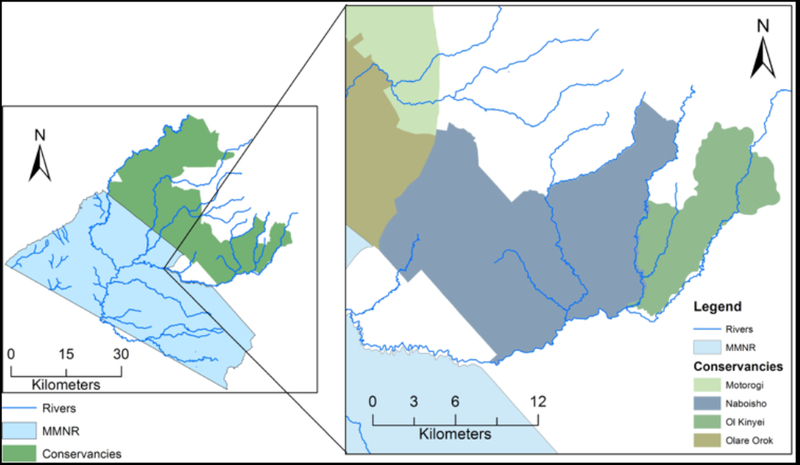 Figure 1: The map below on the left shows the Masai Mara National Reserve and the adjoining Mara conservancies. 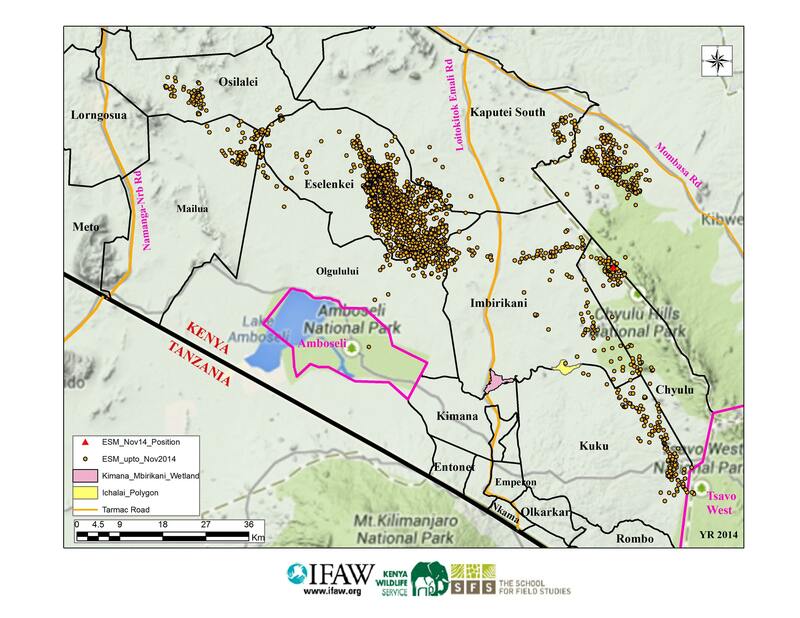 The map on the right shows Ol Kinyei Conservancy where one lion was fitted with a collar. The Ol Kinyei lioness, Nenkume, has a home range of 243 km2 (striped zone on map 2 below) as measured by the Minimum Convex Polygon (MCP). This is the pride’s larger ranging area. Her core area, where she has spent 50% of her time, is only 25 km2 (orange zone on map 2 below). This was analysed using the 50% Kernel Density Distribution (KDD) method. As can be seen from the map, all of her core area is inside Ol Kinyei and Naboisho Conservancies. This core area transverses the length of the conservancy and keeps a distance from the conservancy boundaries. This indicates that this lion knows where she is safe, which is inside the conservancies. In total she has spent 89% of her time inside conservancies. Despite this lion’s territory being located on the edge of protected areas, she rarely ventured into community lands. Left: Collared lion’s MCP (large shaded area) and 50% KDD (small shaded area). Notice how her core area transverses the length of Ol Kinyei Conservancy. Right: Collared lion’s actual tracks (raw data). Niels Mogensen, the Chief Project officer of the Mara Lion Project, writes: “The conservancies surrounding the National Reserve have brought many benefits to the local community. These benefits are made possible through tourism, which is heavily reliant on the presence of high densities of lions. 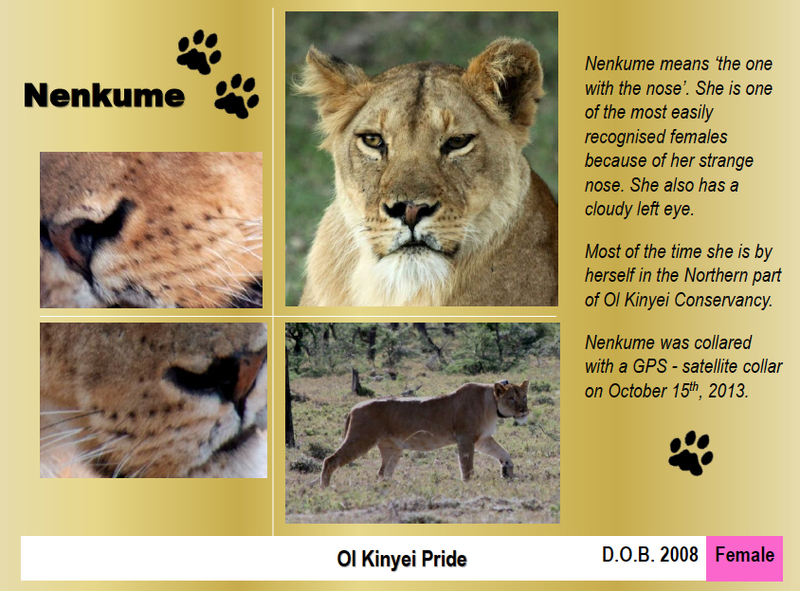 Ol Kinyei Conservancy accommodates a permanent lion pride and the stability of this pride is essential to tourism, and therefore the communities who in turn rely upon this. Data from this collar has made it possible to document the importance of the conservancies for lions. They spend the majority of their time within these safe areas”. The work done by Niels Mogensen in documenting the collared lion’s movements also supports the push to expand the protected habitat by enlarging the area for wildlife through adding wildlife migration corridors to link up with isolated parks, reserves and conservation areas. 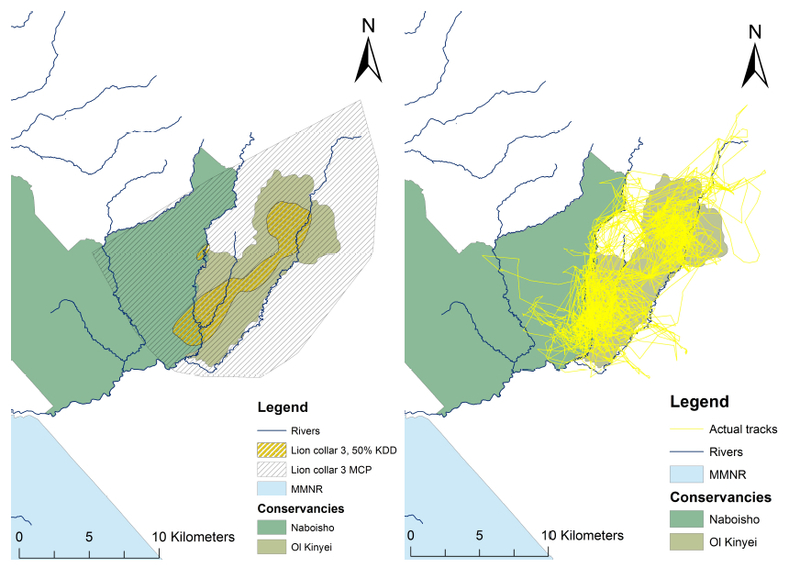 The Director of the Mara Cheetah Project (MCP), Dr Femke Broekhuis, has produced a map of the movements of the cheetah Noosura and her cubs, showing that between April and early May 2015 they covered a distance of almost 100 kms, making a loop around Ol Kinyei and Naboisho Conservancies before returning to Ol Kinyei where they spent a week on the Eastern boundary before wandering across the conservancy border into community land. The Selenkay Conservancy is located within the community-owned Eselenkei Group Ranch which is 10 miles north of the boundary of Amboseli National Park. The Selenkay Conservancy was first established nearly 20 years ago by Gamewatchers Safaris on 14,000 acres of land leased from the local Maasai community with the aim of protecting the wildlife habitat and encouraging wildlife conservation as an alternative means for the local population to earn livelihoods. Migrating species from Amboseli previously had been killed or driven away but are now encouraged to make the conservancy their home. Recent years have witnessed a significant increase in wildlife numbers with elephants returning to the land where the conservancy is located after an absence of two decades and big cats including lions, leopards, cheetahs are now sighted frequently in Selenkay Conservancy. Other species seen in the Selenkay Conservancy include Maasai giraffe, eland, zebra, wildebeest, gerenuk, orxy, impala, grey bush duiker, warthog, aardvark, silver-backed jackal, bat-eared fox, caracal, African wildcat, genet cat, African civet, striped hyena, olive baboon and vervet monkey. 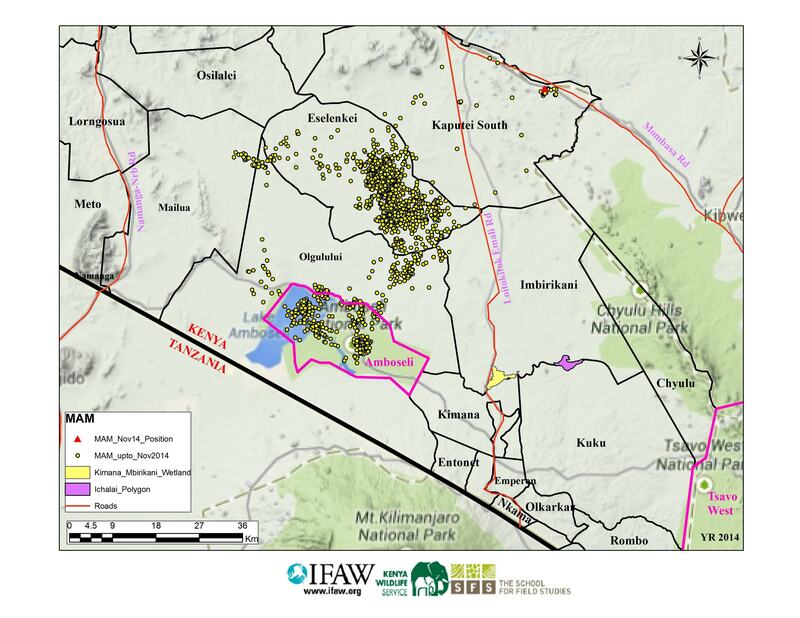 A partnership between Kenya Wildlife Service (KWS), School for Field Studies (SFS) and International Fund for Animal Welfare (IFAW) has been tracking collared elephants in the Amboseli eco-system on a daily basis over the last two years. 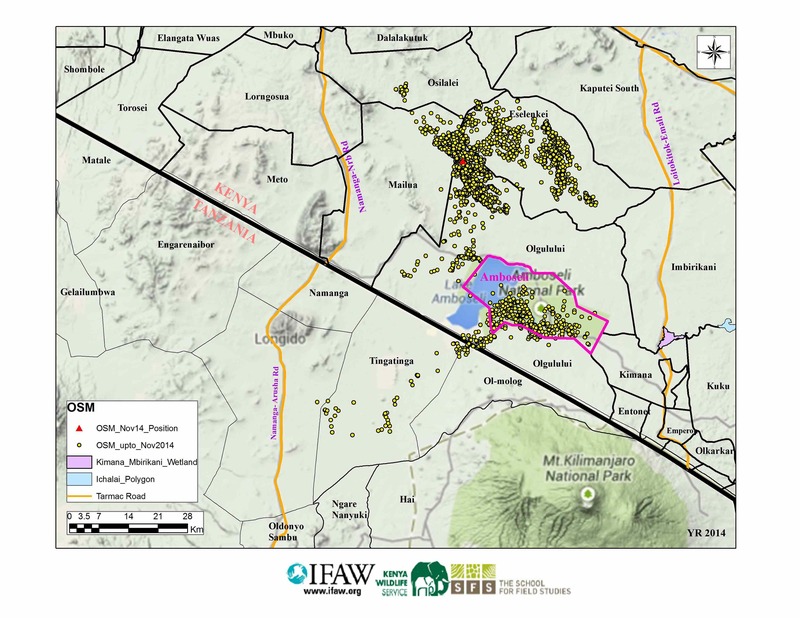 The maps below produced by IFAW, SFS and KWS follow the movements of 3 separate collared elephant bulls (known as ESM, MAM and OSM) and show how they have been using Selenkay Conservancy in the Eselenkei Group Ranch as part of their expanded rangeland beyond Amboseli National Park. This reflects how the elephants have expanded their range beyond the National Park into their former dispersal areas now that they feel safe there once again. Mr Mkala explains that in the community lands beyond Amboseli National Park and Selenkay Conservancy, many land owners are now becoming interested in crop farming as opposed to traditional livestock rearing or creation of wildlife conservancies. He points out that farmed crops will naturally attract elephants, increasing chances of human/wildlife conflict and currently more than 50% of the Kimana Group Ranch, which was wildlife habitat, has been turned into human settlement. As mentioned, Gamewatchers Safaris leased the land north of Amboseli to establish Selenkay Conservancy nearly two decades ago and IFAW has also leased 16,000 acres of land from the community south of Amboseli to secure habitat for elephants and other wildlife and to connect Amboseli National Park to Tanzania’s Longido Game Control area, Enduimet Wildlife Management Area, Tanzanian Kitenden Corridor leading to Kilimanjaro Forest Reserve and National Park in Tanzania and Kitirua and Elerai conservation areas at the south of Amboseli National Park. At Gamewatchers Safaris, we are convinced that one way to conserve the wildlife populations and to avoid a decline in the numbers of animals is to expand the area of protected wildlife habitat beyond the parks by creating wildlife conservancies on tracts of land leased from local communities. Conservancies have a vital role to play in expanding the area of protected habitat. The big challenge is that the cost of leasing land to establish conservancies in the Mara and Amboseli eco-systems is a substantial expense and is borne almost entirely by a few dedicated private sector safari companies (such as Gamewatchers Safaris & Porini Camps) and by other conservation organisations (such as IFAW) . At the conservancies in which we are involved in the Mara and Amboseli eco-systems, we are totally dependent on income from tourism from visitors staying at our Porini Camps to pay for all the costs of the conservancies. During the last two years tourism in Kenya has been experiencing a slump due to fears of global terrorism, causing a reduction in income from tourism and it is becoming increasingly difficult to continue covering the costs of keeping the conservancies in existence. With the commitment of Kenya’s government to give greater support to promoting tourism and with positive news of increasing demand for safaris once again by US citizens, culminating in the forthcoming trip by President Obama to Kenya, there are now some welcome signs of improvement. We need to work for a recovery of our tourism industry in Kenya as the best way to generate the funds needed to support the leasing and management costs of the conservancies if they are to continue to exist and indeed to be expanded!